Carol of Just Let Me Quilt planned and hosted this wonderful blog hop and today is my day to show you what I've created! My home is my sanctuary. I started working when I was 16 and for 40+ years I worked outside my home. Now that I am retired, I enjoy doing all the little things I missed. I'm not talking about mopping or laundry! I'm talking about sleeping until I wake up naturally, watching a movie all the way through, taking my time cooking a meal, and decorating the house to the max for the holidays. Simple things, but they mean a lot. So when Carol suggested we create something that featured a house, I jumped at the chance! A couple of years ago I bought and made Anni Downs' (Hatched & Patched) quilt Gossip in the Garden. I love how embroidery looks in a quilt. So to pay homage to my feelings for home, I decided to emulate her technique. First I draw my design, transfer it to a cotton square, and then embroider it. For this quilt, there are twelve 6 1/2" x 8 1/2" embroidered blocks. Each one represents something special about home. The blocks surrounding the embroidered squares measure 8", 6", 4" and 2". In some places I used 2" wide strips. Each completed section is 16" x 16" and its finished size is 48" x 64". Quilting is minimal and is Stitch in the Ditch. Although I used a lot of my scraps for the blocks surrounding the embroidered blocks, the main fabric used was Freshly Picked from Wilmington Prints. There is no pattern for this quilt as I made it up as I went. I hope you have enjoyed seeing my quilt. It truly was a labor of love. Please leave me a comment and let me know what you love best about being home. Thank you again, Carol, for coming up with such a wonderful idea for a hop. This has been great fun! 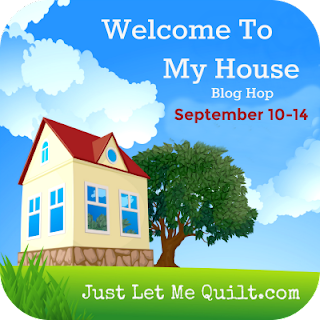 Now go see what beautiful creations my talented fellow bloggers have made! Just Because Quilts - you are here! Your quilt is so sweet! I really love all the embroideries. this is such a cute quilt. I love your embroidered blocks. After working so many years 45+ hours a week, I am happy to be at home doing whatever I want...or nothing at all. Love your quilt and I also love incorporating embroidery into quilts! I retired last year and enjoy being at home and working on my projects! I like your bird singing in the shower block. Getting to do my favorite hobby, quilting, at home is my favorite pastime. Oh, I love your blocks! Are they available by pattern? I don't do much embroidery, but I would definitely make these. Home is where I go barefoot, put on comfy clothes, read, quilt, sleep and just do what I want. It's my happy place. I just love this! That is what I am looking forward to when I retire. I would like to just enjoy my day and not rush around every day. I have a few more years to go and hopefully, my husband and I can travel the country and then I can work on some "hand" projects, along the way. The quilt is wonderful and I do love hand embroidery. I love being at home and sewing every day. I love this quilt. Every block of embroidery is a page in my life. I would buy a book with these in it. Thank you so much for sharing!! Oh my...that labor of love is just wonderful. What a perfect way to make it your own. Love those embroideries. You have a treasure there! Your quilt is charming! I love the combination of fabric and embroidery. Your bio really resonated with me. I have 7 years to retirement & can’t wait. I love just being home, my sewing room is my sanctuary , shared with all my beasties. What wonderful homey feelings are expressed in this fabulous quilt. Thanks for sharing them. I too am retired and I appreciate that I can craft at any hour of the day or night with no consequences. Thank you for sharing your wonderful creation. Love all the embroidered squares. Being at home means to me that I can relax and put my feet up. OM gosh, I love the embroidery in your quilt. I read every single block you shared. I think having a quilt that really means LOTS to you, makes the quilt doubly wonderful. Patchwork and stitchery always great! It is a feeling of contentment when you come home after an absence! I enjoy your quilt and your sense of humor! The embroidery and patchwork marry very well. You have an absolutely amazing quilt. Thank you for participating in the hop and sharing your amazing work with us. How wonderful and meaningful is your quilt?! Just fabulous, thanks for sharing such an intimate project. I admire the embroidery designs and work. I like the vintage appearance, but I love the comfy, use me feel. Great quilt all the way around. I love your quilt. It has so many details about what you love in all the embroidery and fussy cut squares that a person could spend hours looking at it and taking in all the details. Such a personal journey. Your quilt is a real treasure. All the details are amazing and I love that you made the quilt your own by "making it up as you went" along. Your quilt is amazing!! I like how you mixed the embroidery blocks with your other blocks. So very pretty!! Enjoy your day!! How beautiful! Thanks for sharing your labor of love!